Compared to writers like Walt Whitman, Benjamin Franklin, and Henry Wadsworth Longfellow, Anne Bradstreet is a pretty unknown figure in the American public consciousness. Despite her achievement as the New World’s first published poet, she is generally not remembered as one of America’s greats--her work is not often featured in high school or university-level American Literature courses, her name is unfamiliar to most. Put plainly, everything I know about Bradstreet I learned through this fellowship. I have come to appreciate Bradstreet’s creative work and the trials she and other people living in the seventeenth century faced. Reading these historical records and poetry of an underappreciated author has taught me an additional lesson about the transient nature of literary fame--for Bradstreet and other long-forgotten writers. Great, dear, sweet Bartas thou art matchless known"
--Anne Bradstreet's "In honour Of Du Bartas, 1641"
The forward of The Works of Anne Bradstreet by Adrienne Rich continually features Bradstreet’s name alongside another literary celebrity of the past: Du Bartas. Seventeenth-century contemporaries compare Bradstreet to Du Bartas in their introductory verses originally printed in The Tenth Muse; Nathaniel Ward calls her “a right Du Bartas girl,” her name is anagrammed into “Dear neat An Bartas. / So Bartas like thy fine spun poems been, / That Bartas’ name will prove an epicene,” and Bradstreet herself penned the poem In Honour of Du Bartas in 1641. So I began to wonder: who the hell is Du Bartas, and why was he so popular and esteemed? How did he influence other writers of the time, especially Anne Bradstreet? Lastly and most interesting to me, why have his works, and similarly the memory of Anne Bradstreet, not withstood the test of time? The forward of The Works of Anne Bradstreet provides a few tidbits on Du Bartas and the impact his works had on Bradstreet’s own writing. Bradstreet was a well-educated young woman provided with the extensive resource of her father’s library. During the early years of her marriage, Bradstreet often spent her time reading and writing, and Joshua Sylvester’s translation of Guillame Du Bartas’ La Semaine du Creation (translated into English as The Divine Weekes and Works) made quite an impression on her. The poem is an adaptation of the Genesis story from a Protestant viewpoint, and meditates on the seven days of creation and the surrounding drama of Satan and the angels. According to the forward by Adrienne Rich, Du Bartas’ poem was “an acknowledged popular masterpiece,” boasted multiple 17th century English translations, and was also a massive influence on Milton’s Paradise Lost. Rich also notes that, like many people in her day, Bradstreet greatly admired Du Bartas and was heavily influenced by The Divine Weekes, but she almost never attempted to emulate his style or language. Rich observes “She was influenced more by Du Bartas’ range and his encyclopedic conception of poetry, than by his stylistic qualities…at its best her style, even in those apprentice pieces, has a plain modesty and directness which owe nothing to Du Bartas” (xiii). Research into Du Bartas’ work, specifically La Semaine, reveals that it was extremely popular in France for a very short period of time, likely because Du Bartas’ Huguenot beliefs and the distinctly Protestant views permeating his verse were not particularly popular in the largely Catholic France. However, La Semaine found a willing Protestant audience in England, where it had a much longer lasting impact on English writing and culture and, most famously, influenced Milton’s Paradise Lost. Though Bradstreet and other writers of her time praise Du Bartas to the point of excess, I could not find such extreme praise from modern academics. For instance, in Adrienne Rich’s forward to The Works of Anne Bradstreet, she refers to La Semaine as “elephantine” and “quivering with excesses, laborious and fascinating as some serpent winding endlessly along” (xii). Rich acknowledges that despite the tedious challenge it presents to the modern reader, “one can understand its mesmeric attraction for an age unglutted by trivial or pseudo-momentous information,” but such a concession is hardly a compliment, and not nearly so enthused as our examples from the 17th century. It seems that the “lofty style” which Bradstreet lauded in her ode is now viewed as overwrought and unnecessary. In fact, La Semaine’s rapid wane in popularity in France at the time may have been due to the very style English speakers praised. 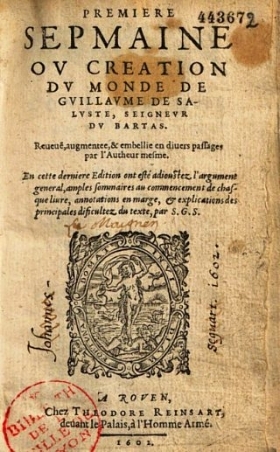 According to Encyclopedia Brittanica’s public website page on Du Bartas, “La Semaine did not remain popular in France for long; its style is marred by numerous neologisms and ungainly compound adjectives, and the didactic intent is too obvious.” It is possible that La Semaine owed its popularity in England at least in part to its English translations, or perhaps cultural attitudes in England were more forgiving towards obvious, reiterated morals in their art? Whatever the reason, Bradstreet’s style, which she often refers to as homespun or simple in her own verses, has proven to be more digestible and praiseworthy in our era than Du Bartas’ bloated eloquence. I personally think that this little story of Du Bartas and Bradstreet is a great example of the ultimate transience of fame and public praise. There are thousands of these stories to be found throughout history of course, but in reading seventeenth-century poets’ praise of Du Bartas against contemporary opinions, I developed a deeper and more lucid perspective on artistic trends than I’ve ever had before. There is something jarring in the emotional realization that the records and names we find in our research were actual human lives. Even if one constantly reflects on the brevity of our own human experience and mortality, the emotional impact of empathizing with long-dead individuals forces us to realize our own transience through the lens of their recorded experience. We recognize the extremely small space we occupy in history because we can compare our impact to theirs. Most of us are not famous figures like Du Bartas, and his story shows that even if fame promises immortality, it’s a promise rarely kept. Time has been a bit kinder to Anne Bradstreet than to Guillame Du Bartas since her works are more often praised by modern critics, but even so, both of these distinguished writers are somewhat unknown today. Trends in popular media probably catapulted Du Bartas to fame in England because of his work’s Protestant flavor, and Anne Bradstreet’s poetry has become more highly regarded since the 20th century precisely due to its simple mastery of language and imagery. Emma Leaden is an English Major with a minor in Film Studies at Merrimack College who plans to graduate in May 2019. She has worked for several Merrimack publications: as the Art Editor for the Expressions literary magazine, as the undergraduate co-editor for Merrimack's interdisciplinary journal Intersections, as well as participating in clubs such as Film Club and The Writer's Circle. Emma enjoys illustration, writing, gardening, reading, and enjoying nature in her free time (when she is lucky enough to have it).